Yo dawg, I heard you like guns, so we made a shooting game about shooting guns with other guns. Amurica. That’s pretty much Tower of Guns in a nutshell, but the game is actually pretty fun. By combining first-person-shooting with bullet hell shmup mechanics and roguelike permadeath, Tower of Guns is action-packed and exciting to play and has more depth than you’d expect. Check out our full Tower of Guns review for all of the details. Tower of Guns is available for $15 by itself, but a much better deal is to pick it up in a bundle with other games. The “GG 2015 Bundle” includes Tower of Guns, Jet Car Stunts, Q.U.B.E., and Unmechanical: Extended for $15. 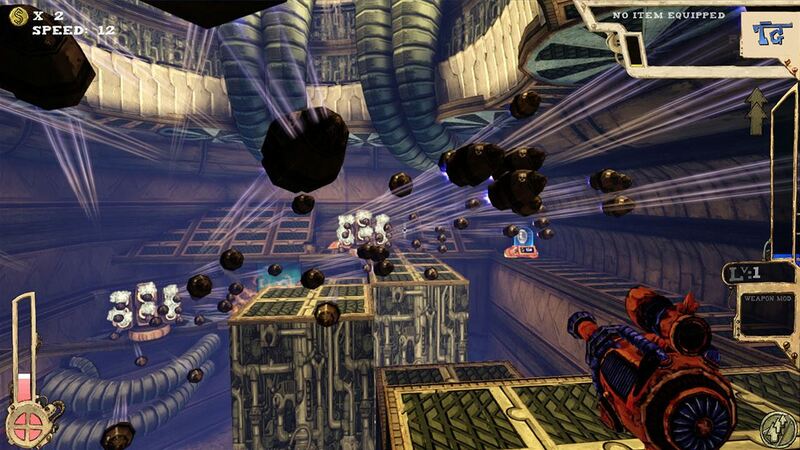 The “First Person Bundle” has Tower of Guns and Q.U.B.E. for $10. I highly recommend the First Person Bundle as both of the games are pretty solid and well worth the $10. Tower of Guns has a silly and funny story, but that doesn’t really matter as the gist is that you’re climbing a huge tower of guns. The idea is that you clear each randomly generated floor full of gun enemies, then fight a boss made of guns, in order to progress on to the next floor where you do it all over again. A normal successful playthrough only takes about 30-minutes, but there is also an endless mode where you’ll just keep fighting through floor after floor until you die. What makes Tower of Guns so compelling is a couple of things. First, you only have one life. If you die, you’re sent back down to the bottom of the tower and have to start all over again. Second, the game uses a very cool upgrade system where you find new weapons and power-ups and movement abilities (triple jump FTW) as you progress through the tower. This gives the game a ton of variety since the loot that drops is random, as are the levels you play through, which means no two playthroughs are ever the same. Not only do you get more powerful as well as more agile as the game progresses, but the levels get increasingly more difficult to match. 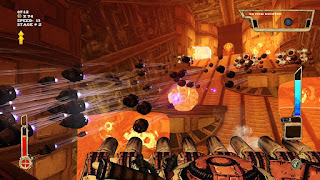 Your enemies in Tower of Guns are mostly just turrets and cannons and other guns of various sizes (with some robots occasionally thrown in cause robots are awesome), and by the end of a run the enemy guns are absolutely filling the screen with bullets like a bullet hell shoot-em-up. 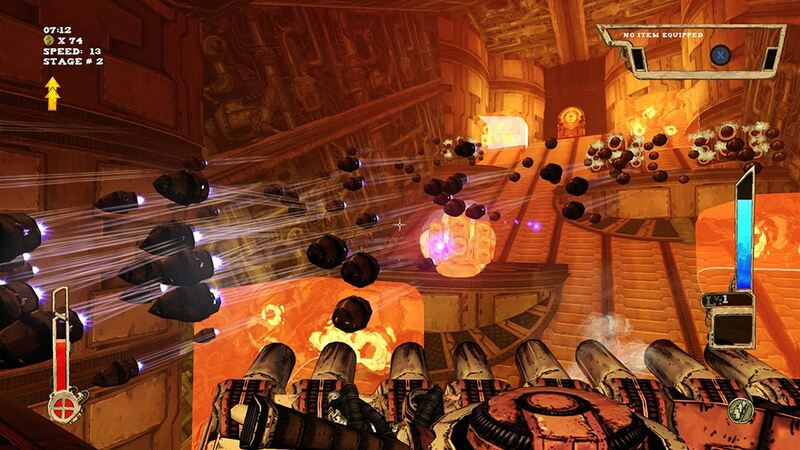 The controls are very responsive and the shooting itself feels great, which makes Tower of Guns a ton of fun to play. The game does stumble here and there, though. When things get really crazy and the screen is full of bullets, the performance gets pretty darn choppy, which makes the platform jumping and shooting a lot more difficult. Also, because the game is all randomly generated, sometimes you’ll have runs that just aren’t very fun because the levels are poorly laid out or the upgrades you want don’t ever drop. There is a flip side to that too, however, where the game will shower you with awesome drops right away that makes that run a cakewalk. Such is the nature of randomly generated games, though. Tower of Guns mostly gray and brown world doesn’t look great, but the cel-shaded Borderlands-style visuals with heavy black outlines on everything does have a definite charm. The sound is largely as you’d expect – lots of gunfire and explosions – but it is all very oldschool FPS inspired, which is awesome. I also like the surpirisngly varied soundtrack full of funk, military marches, electronic tunes, and other music types that somehow all fit perfectly with all of the action. In the end, Tower of Guns is a surprisingly fun throwback to oldschool FPS design. The shooting is great. The random levels are always interesting (and full of secrets). The presentation is nice. The upgrade system is awesome. It’s just a ton of fun to play and has a lot more depth than the title and simple description implies. Tower of Guns is a total blast and well worth a purchase.